One thing you want to avoid is setting the temperature so high that people can burn themselves. Most water heaters have a maximum high temperature of 150 degrees Fahrenheit, so obviously that is the setting most likely to cause scalding. However, water just twenty-five degrees lower than that will require several minutes to reach scalding temperature, giving you plenty of opportunity to adjust the faucet to avoid getting burned. The issue of setting too high temperatures is an especially important consideration for households with small children or those who have disabilities making it hard for them to move. 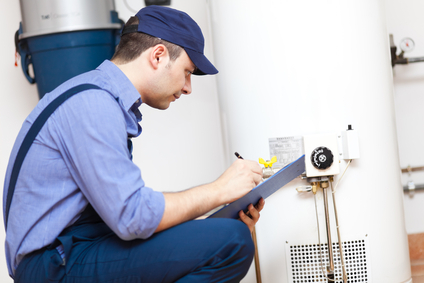 Setting hot water heaters at lower temperatures results in lower heating bills. The general guide is a four percent saving on power for every ten degree reduction in temperature. However, always remember that reductions should be made only in conjunction with concerns over safety and health. Saving money isn’t everything. Hot water kills bacteria and germs that can cause disease. Therefore, setting your water temperature too low can result in health risks. For example, Legionella bacteria, which causes Legionaire’s disease, will thrive in temperatures below 120 degrees, but it is killed instantly by temperatures around 140 degrees. For this reason, choosing a temperature much below 120 degrees to save money would be foolishly compromising your health just to save money. Combining these essential factors of safety, energy consumption, and health, we can see that the ideal temperature range for hot water heaters is between 120 and 140 degrees. Since there is a fluctuation in temperature between the water heater and the tap, you should test your water temperature with a thermometer and keep adjusting the water heater temperature accordingly. Whether you set it at the high or low end of that 120-140 degree range depends on whether you have children, elderly or disabled people in your household and their personal preferences.